Well, it wasn’t the often rumored PS3 price cut that the masses keep talking about, but, Sony has issued a release lowering the PS2 down to $109.99 CDN. FOSTER CITY, Calif. March 31, 2009 – Sony Computer Entertainment America (SCEA) today announced that PlayStation®2 computer entertainment system will be available starting April 1 for $109.99 CDN (MSRP). Since launching in 2000, PlayStation 2 has sold more than 136 million sell-in units worldwide*, making it the most popular system in gaming industry history. PlayStation 2’s vast library of games from all genres for all types of audiences will grow to nearly 1,900 titles this year. This breadth and depth of content along with the new price point make the platform a stronger value than ever, particularly for families, casual gamers, and those seeking to maximize their entertainment dollar. “PlayStation 2 set the industry standard for worldwide mass market adoption and is a clear embodiment of Sony’s commitment to platforms that deliver 10-year product lifecycles. It’s a tribute to outstanding technology, great consumer value and unprecedented development support that we’ve now been able to do twice what no one else has ever accomplished,” said Jack Tretton, president and CEO, SCEA. “Demand for PlayStation 2 remains strong throughout the world, and the new $109 CDN price point will bring in new consumers who will discover how PlayStation platforms are an outstanding choice for their gaming and home entertainment needs. Just as PlayStation 2 is delivering on a 10-year lifecycle and helped expand and solidify the DVD format for home entertainment along the way, we believe PLAYSTATION 3 offers the same promise by helping secure the Blu-ray format and delivering unprecedented value as the total home entertainment solution for the next decade.” SCEA will continue to support PlayStation 2 system with new titles that appeal to families and casual gamers looking for social entertainment experiences. First-party games such as MLB® 09 THE Show™ and MotorStorm®: Arctic Edge as well as major franchise titles from SCEA’s publishing partners demonstrate the continued growth of the platform’s library of content. In addition, more than 250 best-selling PlayStation 2 titles have achieved “Greatest Hits” status, providing consumers with plenty of games to choose from at value pricing. PlayStation 2’s impact on the industry is unmatched, as the platform played a key role in establishing the popularity of the most recognized and beloved franchises in history, including Guitar Hero® from Activision, Metal Gear Solid® from Konami Digital Entertainment, FINAL FANTASY® from Square Enix, Grand Theft Auto™ from Rockstar Games, as well as Gran Turismo™ by Polyphony Digital Inc. and Sony Computer Entertainment Worldwide Studios titles, including God of War® and Ratchet & Clank®. In recent years, this stellar lineup has expanded to include an extensive list of social games and family-friendly titles such as Buzz! ™ and SingStar®, which have helped usher in new types of consumers into the world of gaming. During its lifespan, PlayStation 2 system not only has pushed video gaming to the forefront of entertainment, but it also introduced the concept of an entertainment system becoming a hub in the living room. PlayStation 2 was the first home computer entertainment system to integrate DVD technology, and the rapid growth of the install base helped establish DVD as the standard optical disc media format worldwide. Featuring both DVD and CD playback capabilities, PlayStation 2 system has served as the entertainment centerpiece in many living rooms. PlayStation 2 remains the most played computer entertainment system on the market, according to a December 2008 report from The Nielsen Company. Last year, PlayStation 2 became the first system in history to reach the 50 million sell-in unit sales milestone in North America, making it one of the most successful technology products ever. 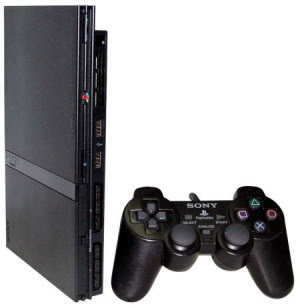 PlayStation 2 system was previously available for $129.99 (MSRP).